Posted 2/8/2019 2:20pm by Cherry Valley Organics. Did you know that most air fresheners and room sprays are made from a concoction of synthetic chemicals? The Huffington Post declared synthetic fragrance sprays to be "The New Secondhand Smoke" in this recent article. And in this article by the Washington Post, the author discusses the dangers of these fragrances for people with chemical sensitivities, and also points out that even people without sensitivities are reporting issues. While the smell of a "Wild Orchid" or "Sea Breeze" is marketed with the image of freshness and clean-living, the truth is, these products contain chemicals that we really shouldn't be breathing in. 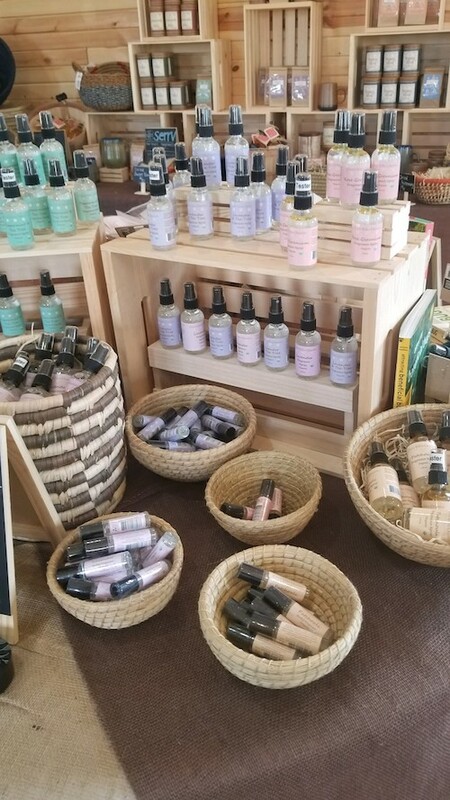 Instead, if you want to freshen a room, your car, the bed linens, bath towels, or even your yoga mat, you should turn to all-natural, organic fragrances like ours. Instead of a mixture of synthetic chemicals, organic fragrances like ours are made from water, essential oils, and herbal tinctures. Their list of ingredients is short, but they offer high-impact fragrance. You'll get a burst of long-lasting fragrance from just one squirt. Plus, our fragrance sprays are in a pump-style bottle, not an aerosol can that uses a propellant. To make our organic fragrance sprays, we use organic rye or vodka to create a tincture using herbs grown right here at our USDA Certified Organic farm just outside of Pittsburgh, Pennsylvania. The herbal tincture is then combined with distilled water and various essential oils until we achieve the perfect level of fragrance. All of our fragrances are vegan-friendly as they contain no animal products. Nor are they ever tested on animals. In addition to our selection of room spray fragrances, we also carry our fragrances in roll-on style packaging. A touch of our roll-on fragrances behind the ear, on the wrist, or on the back of your hand provides aroma-therapeutic properties, without the expensive price tag. 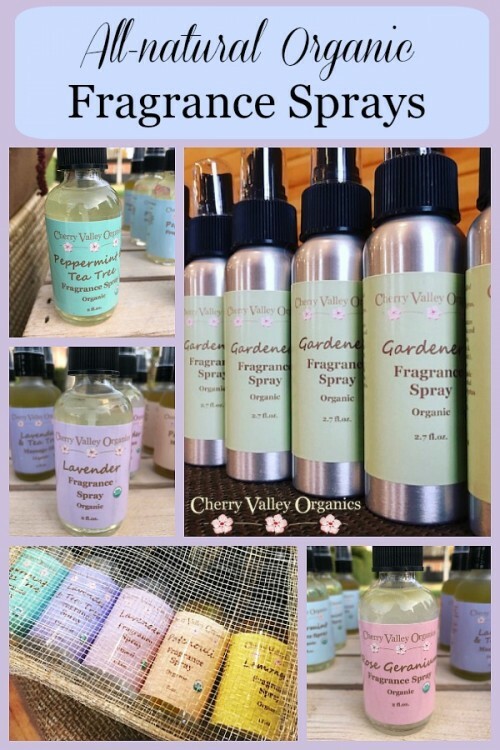 In addition to our room and roll-on fragrances, we also have a special organic fragrance spray made just for gardeners and anyone else who spends a lot of time outdoors. Our Gardener's Fragrance Spray is composed of a unique blend of essential oils thought to repel biting insects. 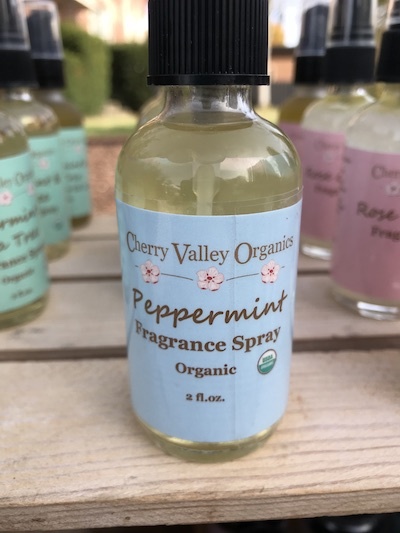 Included in this specialty fragrance spray is eucalyptus, peppermint, lavender, citronella, and more. 100% all-natural, organic, and it smells oh-so-good! You'll find our Gardener's Fragrance Spray here. In addition to purchasing our fragrances through our webstore by using the embedded links above, we also carry the full collection of our scents in our store. The Cherry Valley Organics Farm Market and Cafe is located at 1713 Main Street in Burgettstown, Pennsylvania. You can also reach us via email for more information or store hours at info@cherryvalleyorganics.com. 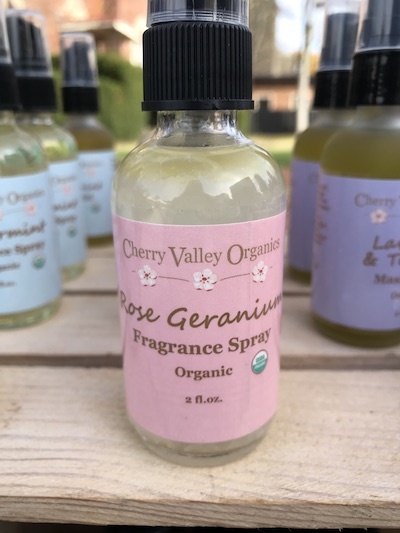 Oh, and one last way you can use our all-natural fragrance sprays: They make a great organic substitute for the popular toilet-bowl sprays that stop the stink before you go! Just sprits a few pumps of our fragrance into the commode water prior to use and no one will even know about "your business."